Invasive plants are like pieces that just don’t fit right in Maine’s ecological puzzle. By crowding out native plants they leave holes in the food web and can exclude other pieces of the puzzle, which create even larger gaps. These gaps in the food web can cascade and eliminate the food source for other species like caterpillars, an essential food for baby birds. Maine’s chickadees depend upon caterpillars to provide their nestlings with protein to grow and develop into adulthood. Yes, all this can happen just because we decide to plant an invasive species into our landscape. In some of Maine’s forested areas the entire forest floor is covered with plants like Japanese barberry with its many needle-like spines. Although white-tailed deer seem to eat almost any plant, they do not like Japanese barberry. The barberries create a food desert for deer and open large holes in the ecological puzzle. So what is a gardener to do? There are many alternative plants that provide equal or better aesthetic characteristics in our landscapes. Some are non-natives that behave and don’t spread around like “invasive” plants, but even better, some are Maine natives that fit perfectly into our ecological puzzle. All our native trees provide the beautiful colors and contrasts that bring leaf-peepers to Maine every fall. Think of the deep yellows of birch and aspen and the purples and reds provided by maples and ash. Some native shrubs are known for vibrant colors like dogwoods with their striking red or yellow stems, and many other natives produce nutritious fruits like viburnums, huckleberries and thimbleberries. Forgo planting a ‘Crimson King’ Norway maple. Instead, appreciate the brilliant fall color of a native red maple or the sugary goodness of a sugar maple. Enjoy the fruitful antioxidant rewards of a highbush blueberry or a red chokeberry in place of the food desert created by Japanese barberry. Make wreaths from winterberry, wild rose or staghorn sumac instead of the tree choking Asiatic bittersweet whose berries can be picked off wreaths and planted elsewhere by birds and mice. The true natives have provided sustenance for our wildlife for thousands of years. Their blossoms are configured just right for the pollinators that have been visiting them for centuries. Additionally, the natural protective “pesticide” chemicals native plants produce do not affect the caterpillars and other grazers that feed on them and help create the food web. What is a “true” native plant? Many in the plant business use the term “native” rather loosely. To me true native plants are those that have grown and evolved here before European arrival, unlike most of us Maine “natives” who descended from immigrants. Many native plants have wide ranges that span the continent. Take red maple (acer rubrum): the species grows west to the Mississippi and south to Louisiana. Is the red maple growing in my yard the same as a red maple growing in Louisiana bottomland? If I planted the winged seeds from a Louisiana tree and grew it in Maine, could I say the tree is native to Maine? The species is native to Maine but the “genotype” in this example is not. Genotype is determined by provenance—the original geographic source of the seed—so the seed from a tree in Louisiana is a different genotype from a seed produced by the tree in my yard. The biotic and abiotic factors in the local environment affect the characteristics of the tree. The progeny of a Louisiana red maple may not even survive a Maine winter. The flowers may open too early or late so the local pollinators may not be able to pollinate as well. Animals that eat the seeds may find the new genotype’s seeds are unpalatable. The Maine native red maple has adapted to our local soils, rainfall and pollinators. Many local nurseries are now offering a wide selection of native plants. The plants they offer may not be “true” natives however. Some may be cultivars (cultivated varieties) which have different colors or flower shapes than the “true” native. Others may be native to other parts of New England or even into the Midwest. You may want to ask if the producer/seller knows from where the plant originated, and if it has been altered through plant breeding. The Wild Seed Project can help if you are looking for “true” native plants. They offer seeds and plenty of advice so you can start your very own “true” native plants. Planting Maine native plants helps keep Maine’s ecological puzzle together. This complete picture is essential to the survival of many species we love and depend upon. 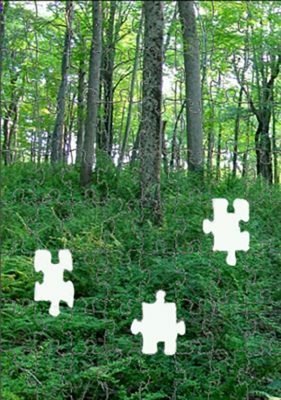 Help keep the puzzle whole and choose to exclude invasive plants from your garden. Starting January 1, 2018 Maine will prohibit the sale of 33 invasive terrestrial plants. For the complete list of prohibited plants and more information on great alternatives, go to maine.gov/hort. Gary Fish is the State Horticulturist at the Maine Department of Agriculture, Conservation and Forestry and the coordinator of the Maine YardScaping Partnership. He can be reached at gary.fish@maine.gov. The Maine YardScaping Partnership provides a listing of native plant sources with an updated list of retail and wholesale suppliers. Of course as mentioned above, buyer beware, many plants labeled as native may actually be cultivars or hybrids and may not provide the same level of ecological compatibility that “true” natives provide. Wild Seed Project is a 501(c)(3) nonprofit organization.